The C-30, a Bill Tripp design, was built from 1971 to 1973. According to John Broughton's records, there were 287 copies made. 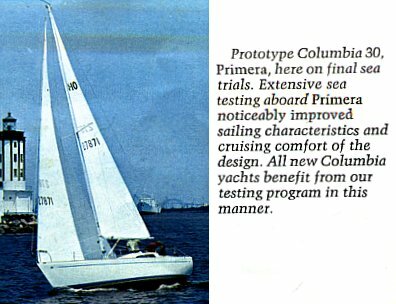 While Columbia boats had 4 or 5 distinct styling themes, the C-30 had a look of its own. The hull has a look similar to the other Tripp "bubble tops", but it's not quite the same. The stern turns back down into a skeg that carries the tiller-controlled rudder. And while Tripp's other boats followed either the bubble top profile or the more traditional full cabin look of the mid- to late- sixties Columbias, the C-30 was a raised deck design. But unlike the full keels of the Sparkman and Stephens derived raised deck designs - the C-24 Challenger and the C-29 Defender - the C-30 had a fin keel. The C-30 had four possible varients. It could be had with either a short rig or a standard rig, and it also had standard and shoal draft keel options. The following specifications and diagram came from a Columbia brochure circa 1973. Length Overall             29' 11 ½"      29' 11 ½"
or                       30'  0 ½"      30'  0 ½"
Length Waterline           26'  6"        26'  9"
Beam                        9'  6"         9'  6"
Draft                       5'  9"         3' 11"
Displacement           10,500 lbs. 12,700 lbs. Ballast                 5,100 lbs. 7,300 lbs. Standard Rig                   515 sq. ft.
Short Rig                      462 sq. ft.
between 201-250 and 251-300 probably did not get used. We were at Catalina Island off of California coast and spotted what looked like a overgrown bubble top 26. We talked with the owner and asked him if it was a 26 and he was most offended at the apparent insult. It turns out he has one of two prototype Columbia 30's. It was basically the Columbia 30 hull (with its extended rudder visible at the waterline, and a vertical transom) with a bubble top deck like the 26 and MKII 34. The owner's son mentioned that there was another in San Diego. Since then I received a report of a modified Columbia 30 - a custom Columbia 33.